I don't know that we necessarily saw the type of polling avalanche this week following the Paul Ryan rollout that many expected. That was certainly true today with no new publicly available survey data. All that was out there were the leftovers from Thursday; a Mitchell Research survey out of Michigan. The aforementioned Mitchell poll is about par for the course in the Great Lakes state at this current juncture in the race. It is very much in line with the FHQ weighted average for Michigan not to mention most of the recent polling there. The persistent Obama lead is only part of the story. The silver lining embedded in this particular poll is that earlier Mitchell polls showed a +1 for Obama and a +1 for Romney in their June and July (respectively) iterations. Counter to some of what we have seen in the polling released in the Toss Up and Lean Obama states this week, the president has increased his advantage relative to earlier polls by the same firms. Is this statistical noise or is it evidence of a trend? It likely tips toward the latter if the trend is a fairly consistent polling margin in Michigan for Obama. As FHQ mentioned in yesterday's update, Michigan is in a tweener group of three states within the Lean category, but not to far off from being designated Toss Ups. Michigan, along with Wisconsin and Nevada are in a different subcategory than fellow Lean states, Pennsylvania and Oregon. Again, these three are in a pretty consequential position. All three are close enough to warrant some attention and are all ripe for the picking in terms of Romney utilizing his fundraising/spending advantage. 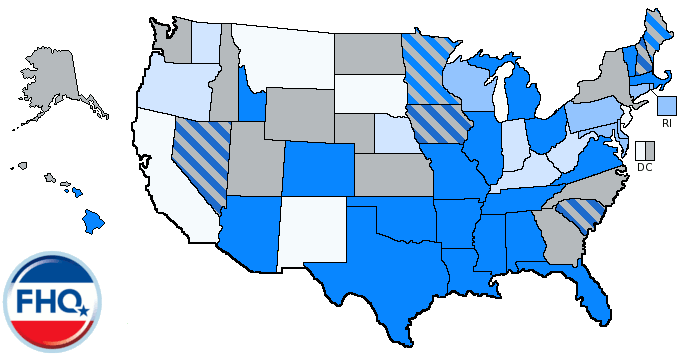 Forcing Obama to play defense -- to the extent the Romney campaign can do that -- in those states means less resources for states like North Carolina, in particular. That makes the signals from the Obama campaign following the Democratic Convention in Charlotte so important. If things are tight financially, the likelihood of the Democrats pulling out of the Old North state increase. That is doubly true if Romney/Ryan are able to cut into the president's advantage in some or all of tweener Obama Leans. 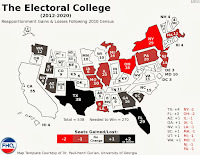 As it stands now, the status quo is maintained on both the electoral college map and the Electoral College Spectrum. But the bottom of that second column from the left is where we should watch as the conventions come and go. 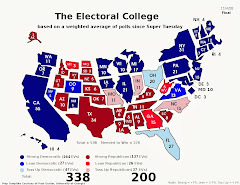 2 The numbers in the parentheses refer to the number of electoral votes a candidate would have if he won all the states ranked prior to that state. If, for example, Romney won all the states up to and including Ohio (all Obama's toss up states plus Ohio), he would have 272 electoral votes. 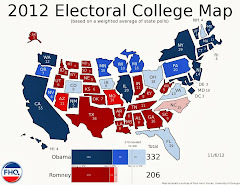 Romney's numbers are only totaled through the states he would need in order to get to 270. In those cases, Obama's number is on the left and Romney's is on the right in italics. Like the figures above, the Watch List is untouched today. The gap in Michigan closed the tiniest of margins, keeping the Michigan-Nevada-Wisconsin troika within a tenth of a point. 1 Weighted Average within a fraction of a point of changing categories.